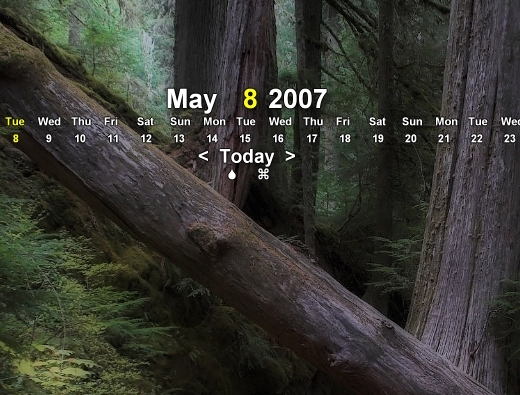 Displays calendar on desktop, and colors today date and label. Supports changing colors, ability to display it in 4 styles, regular horizontal, flipped down horizontal, vertical, flipped sideways vertical. 1. If date changed to a new month, IE May 1st, it wouldn't update to new month till you press "Today" object. It now does it automatically. Original version: New code base. 1. No more separate versions for horizontal and vertical modes. It now supports all 4. 2. Completely new and much more convenient color change dialog. Yeah? HMM I'll try that. Before that wasn't a option simply because I didn't want it to get too complex with too many icons, but now it's using FORMS in order to set settings, so it's easier to add settings without adding icons. It may be a little while before I finish it since I'm working on appointments version of this. No probs... I've modified it locally for personal use on my desktop so I'm personally not in any hurry, just thought it'd be a nice addition. Having a weird thing happening lately. The current day numeral and colour aren't displaying. For example, take a look here (btw, today is the 16th). I've tried emptying my cache, but have had no success fixing it. Any ideas? Hmm did you click today text? I think it's bug related to changing months. No problem. I has an improved version, but I'm still working on it to complete the apps version which has number of minor bugs fixed too. I'll look into the changing month bug, though! Thanks! I really appreciate this tool. Anyway it can read TTF fonts? I have a couple of fonts that I downloaded I'd like to use. I think it will work with any installed font. Just copy those to special font folder in windows directory ( most versions of windows ). If you are not sure, just google it.